As Catholics, we believe we are never alone; as we go about the business of our lives, we are covered in prayer by the angels and the saints. They are our constant companions in our journey to God. We also know that if we want to complete that journey, it’s not enough to just travel with the angels and saints; we must become like them. We must become saints. That’s the end to which God calls every man, woman, and child. Yet, while we know that’s what God desires, actually attaining that end can seem, at times, impossible. How can we become anything like the great heroes of salvation history? How can we even come close to the holiness of her most beloved saints: Saint Paul, Saint Augustine, Saint Thomas Aquinas, or Saint Thérèse of Lisieux. 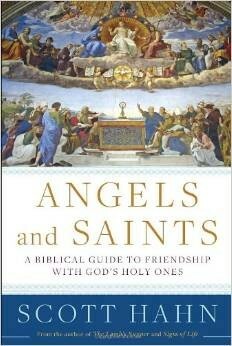 In his newest book, Angels and Saints, St. Paul Center President Dr. Scott Hahn answers those questions and more. In a series of engaging reflections and stories about the nature of angels and the lives of notable saints, Dr. Hahn demonstrates just how much we already have in common with our older brothers and sisters in the Faith, and how, with their help, we can follow more closely in their footsteps. Here’s what others are saying about Angels and Saints.